Your horse finishes work and you want to provide some additional relief to his legs. What do you use? Two weapons in every horseman’s arsenal should be liniments and poultices. These are time-tested remedies for helping performance horses recover from a hard workout. So what are liniments and poultices? Let’s look at liniments first. A liniment is a liquid, or in some cases a gel, that you apply to your horse’s body to help with cooling down, pain, stiffness, or soreness. Liniments often contain alcohol or oils along with various medicinal herbs and additives. Liniments may help cool down or warm up an area; the exact effect depends on what is in the liniment and whether or not you apply it, and then wrap over it. Beneficial effects may also be due to the massaging and rubbing used to apply the liniment to the horse. Depending on the additives, some liniments should never be put on an open sore or wound or applied and bandaged over. Strong ingredients could lead to blistering. A common use for a liniment is to dilute it in a bucket of water for a bracing post-workout wash. Think of it as “skin bracer” for your horse. You can also follow a pure-water washing with a liniment rubdown for muscle care. A liniment containing alcohol will help to cool off a hot horse. The alcohol component will evaporate quickly, taking some heat with it. Many oil components then stimulate dilation of the capillaries, which will also hasten cooling off. 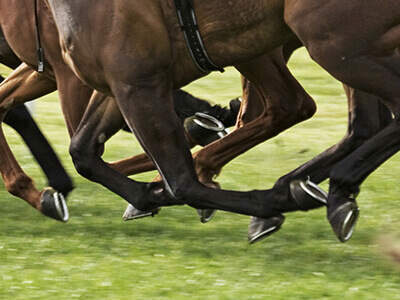 Another use for a liniment would be to carefully rub down your horse’s legs after a workout. The liniment will provide cooling benefits, and your rubbing will help you identify any sore or swollen areas. Catching problems early almost always means faster resolution. Some liniments contain oils that will “heat up” or “cool down” an area. Common ingredients include menthol, mints, eucalyptus, and capsaicin (from chili peppers). Most of these liniments will warm up the area they are rubbed on. Adding warmth is important for older horses. A rubdown before a workout and after a workout on any problem areas can greatly increase a horse’s comfort. Always read the directions carefully on liniments. Some of these liniments can be applied with the treated area subsequently wrapped over to prolong the beneficial heat. Others could be irritants if wrapped over, and some require dilution so they aren’t caustic to the skin—so always read before you apply! The phrase “setting up” refers to treating your horse’s legs after a thorough workout. If your horse tends to show stiffness after heavy work, you can rub a liniment on his legs. Follow that up with some wraps and you have a therapeutic treatment for minor problems. Consult your veterinarian if your horse frequently needs help with stiffness, so you can ensure that you aren’t covering up a developing problem. Old injuries may respond to a version of the setting-up system. In those cases, you definitely want warmth on the area. To prolong the heating effect of a liniment, you can wrap cellophane over the area before putting on your traditional cotton wrap. This will help to “trap” the heat and provide warmth for a longer period of time. Always be sure your liniment is safe to use in this way and won’t blister the leg. A poultice is a soft, moist mass of material applied to a horse’s knees, legs and ankles. Most poultices used for horses contain some type of clay, but cereals such as bran and herbs can also be used. Poultices can have a cooling effect or a warming effect depending on the ingredients and how they are applied. Poultices have many uses, such as helping with a sore leg or drawing out an abscess to drain. The exact action can be changed by application method and temperature. Cold therapy helps to reduce pain and minimize swelling. It is best for acute injuries. Older injuries or potentially abscessed areas benefit most from heat therapy. A cold poultice is handy for a horse with a sore area on a leg. To prepare a cold poultice, mix your ingredients and store them in the refrigerator or freezer for a short time, or use a pre-made product such as Icetight 24-Hour Poultice, a cooling natural clay poultice. Then apply the cold poultice to the leg and cover it with a damp cloth or damp brown paper (the damp covering will help to prolong the chilling effect of the poultice). Finally, apply a wrap over the cloth or paper. The heat from your horse’s leg will gradually warm up the poultice, so it will need to be replaced periodically. Icetight 24-Hour Poultice can be used after every workout or competition and washes off easily with water – no rubbing or hand washing necessary. 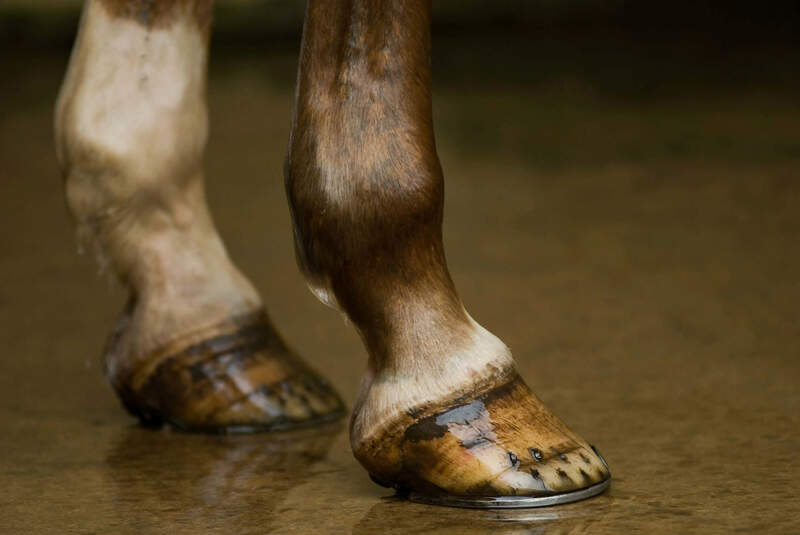 Warm poultices can be superb for dealing with hoof abscesses and sole injuries. To prepare a warm poultice, mix your ingredients up and heat them lightly in a microwave. Always test with your skin to be sure it isn’t too hot. Ingredients like Epsom salts will help to “draw out” abscesses; your goal is to get the abscessed area to open and drain. For a hoof abscess, a warm poultice is applied, followed by a waterproof and impervious covering to help hold the warmth in. A baby diaper works well, or cellophane covered with duct tape. The poultice will have to be replaced periodically, as it will cool off. For any recurrent soreness in your horse, you should consult your veterinarian. She can then advise you as to what “home care” you can use to help your horse recover and get back riding. Liniments and poultices are two ways horse owners can aid in the care and recovery of their horses, so be sure you have them in your toolbox!